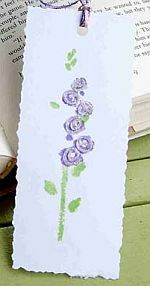 Make a sweet bookmark for a Secret Sister at church - or for any friend and family member anywhere - as a thoughtful gift. 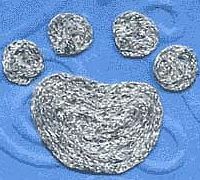 The iron-on thread makes the rubber-stamped image 3-dimensional. 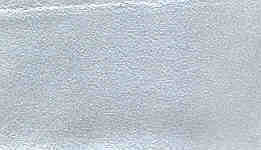 white cardstock cut to 5 1/2" x 2 1/2"
1. Turn your iron onto the highest heat setting and let it heat thoroughly. 2. Stamp the flower image onto your white cardstock. Let dry. several seconds until the thread adheres. We make swirl circles in the center ofeach flower. 5. Punch a hole in the top of the white cardstock and run extra pieces of ribbonthrough as a tassel. 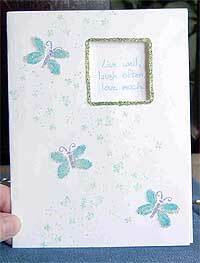 If desired, write a passage from the Bible or other favorite saying on the back. If you have trouble printing this page and would like us to send you a printed copy send a #10 SASE to: Secret Sister Bookmark, P.O. Box 1258, Parkersburg, WV 26102. 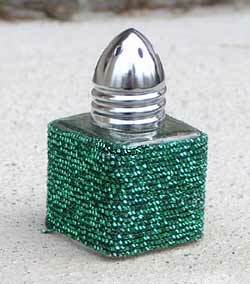 Iron-on thread, Teflon and min iron available from Kreinik. Visit www.kreinik.com for online order or a store locator.